A highly fatal disease of deer has been detected in Ontario. Two white-tailed deer from London, Ontario were submitted to the Canadian Wildlife Health Cooperative (Ontario-Nunavut Region) in early September. At autopsy, both deer had systemic bleeding consistent with Epizootic Hemorrhagic Disease (EHD). The National Centre for Foreign Animal Disease, Canadian Food Inspection Agency (CFIA) confirmed the presence of EHD virus serotype 2 using virus isolation and serotype specific PCR and sequencing. To our knowledge, these are the first cases of this disease diagnosed in Ontario. Hemorrhagic disease in deer may be caused by two closely related viruses: EHD virus and Bluetongue virus. Blood-feeding biting midges (small flies, also called “no-seeums”) spread the virus between deer. Affected deer may develop fever, depression and have trouble breathing before dying. Sick deer seek water out of thirst and to cool off from their fever, and therefore, dying or deceased deer are often found in water bodies. The biting midges also prefer damp habitats, which also makes it more likely to find sick or dead deer near water. This disease is common in white-tailed deer populations of some southern US states. Historically, outbreaks have occurred every few years in more northern zones. But in recent years, these northern outbreaks seem to be occurring more frequently. The reasons for this are unknown, but many scientists believe that climate change is involved. 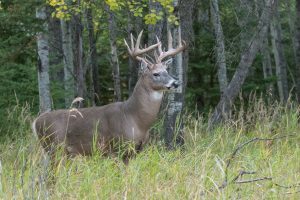 Because EHD virus is new to the area, deer populations in Ontario lack pre-existing herd immunity, which may lead to greater rates of transmission and higher numbers of affected deer. Currently, there is no vaccine licensed for use in North America or other feasible preventative measures. After the first frost, biting midge numbers are drastically reduced, so transmission is expected to stop. Therefore, the duration and severity of the outbreak will depend in part on weather patterns. Drs. Nicole Nemeth and Samantha Allen in the Department of Pathobiology at the Ontario Veterinary College are characterizing midge biology in the region. They are also testing for past virus transmission in livestock and deer. This project is funded by the Ontario Ministry of Agriculture, Food and Rural Affairs (OMAFRA)-University of Guelph Research Program, the Ontario Sheep Marketing Agency and Ontario Federation of Anglers and Hunters. This ongoing research project, which involves sample collections in 2017 and 2018, is a collaboration with the CFIA, the Ontario Ministry of Natural Resources and Forestry (OMNRF), and the CWHC. There is no evidence that this disease affects humans; however, individuals handling sick or dead animals should wear protective clothing, gloves and wash hands thoroughly. If you see sick or dead deer, please contact the Canadian Wildlife Health Cooperative or the OMNRF’s Natural Resources Information Centre.